Born in Lancaster, Pennsylvania, Father John was raised in a vibrant Greek Orthodox home. Witnessing the faithfulness of his mother, who is from Kos, Greece, and the fervor of his father, Fr. John was blessed with a firm foundation in the Orthodox Christian Faith. Both parents, now deceased, imprinted Fr. John with a love for the faith and a great enthusiasm to share its wonders. Indeed, one of the hallmarks of his home life was weekly Bible studies and dialogues on matters of theology. With icons set everywhere in the house by Fr. John's father, who was an iconographer, a fertile soil for spiritual growth was set. Around the age of ten, his faith was set afire. His mother and father both fed the fire until the time to take ownership of his own faith. 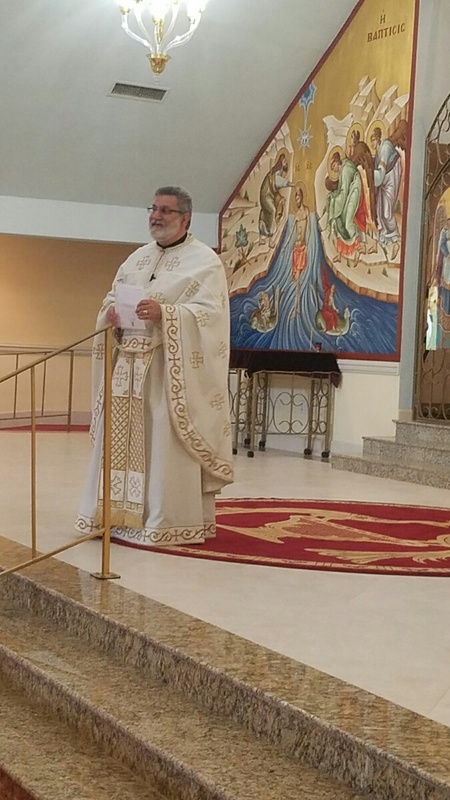 Baptized and raised in the Annunciation Greek Orthodox Church in Lancaster, Pa, Father John was exposed to an active community and was blessed to be mentored under the leadership of Father Alexander Veronis. Father John's youth was richly populated by attendance of dynamic spiritual retreats, weekly Bible Studies, youth choir, and Christian camp, particularly Camp Nazareth in Western Pa. In such a positive and healthy Orthodox Christian atmosphere, Father John felt called to the priesthood around the age of thirteen. Having great teachers in high school, Father John excelled in English, literature, and public speaking, and graduated Valedictorian of his class. He attended Millersville University of Pennsylvania, where he received a B.A. in English, with a minor in History. The major event of his college education was the blessing of meeting his wife, Miss Karen DiLorenzo. While courting, Fr. John moved to Boston to begin studies at the Holy Cross Greek Orthodox School of Theology. In 1985, they were blessed to be married, and lived in Boston until the completion of Father John's studies at the seminary, where he graduated with a Master’s degree in Theology. In the years following seminary, Fr. John served as a Youth Director at Holy Trinity Greek Orthodox Church in Wilmington, Delaware and at Holy Trinity Greek Orthodox Church in Canton, Ohio. While in Wilmington, Delaware, Fr. John was very active in the youth and young adult work of the Delaware Valley Youth Commission of the Metropolis of New Jersey. Taking a break from church youth work, Fr. John went into teaching. He taught English and Rhetoric and Writing at two schools (University of Akron and Malone College). During the summers and breaks, to make ends meet, he worked as a house painter, pizza delivery man, newspaper reporter, ads salesman, and taxi-driver. During this "break" from official church life, he remained active with the youth, Sunday school, chanting, and reared his family in the spiritual atmosphere of the local Canton Orthodox Churches, and was regularly supportive of Metropolis of Pittsburgh camps and retreats. Life returned Fr. John to church work, when he heard of an opening for a "Director of Religious Education/Youth Director" at the Greek Orthodox Cathedral of Saints Constantine and Helen in Richmond, Virginia. Being delighted to work with Father Nicholas Bacalis, the Dean of the Cathedral, Fr. John signed on for an indefinite period of time. The Cathedral proved to be a wonderful place to serve and was very fruitful as a place to grow in faith and to raise children. Shortly thereafter, Fr. John was blessed to be ordained to the Diaconate in his home parish of Lancaster, Pa. under the blessed hand of His Eminence Metropolitan Maximos, on November 25, 2001. A year later, he was ordained to the Priesthood in the Cathedral under the blessed hand of Archbishop Demetrios on December 1, 2002. Father John served at the Greek Orthodox Cathedral of Saints Constantine and Helen in Richmond, Virginia for 12 years until December 2011. Father John was blessed to be named the fourth priest at St. Nicholas Greek Orthodox Church in Virginia Beach, VA, in January 2012. Upon moving to Virginia Beach, Presbytera Karen found work in her field as a registered nurse in the emergency room at Bon Secours DePaul Hospital in Norfolk, Virginia. She continues her studies in medicine, and volunteers with mission work in Guatemala. Father John and Presbytera Karen have been married since 1985 and have been blessed with four children: Deanna, a graduate of James Madison University, and works as a nurse, is happily married and residing in Richmond, Virginia with husband Nick, daughter Kalliope, and son Dionysios; Thomas, also a graduate of James Madison University, and of Holy Cross Greek Orthodox School of Theology (Master of Divinity), has served for four years as the Youth Director at the Annunciation Cathedral in Norfolk, Virginia, is now doing missionary work in Guatemala with his lovely bride, the former Elizabeth Marshall of Norfolk, Virginia; Sarah is a graduate of Mary Washington College, has taught in the Virginia Beach Public Schools for five years, now attends the Holy Cross Greek Orthodox School of Theology; and Nicholas, married to the former Demetra Panapoulos of St. Louis, is a graduate of Hampden-Sydney College, attends Holy Cross Greek Orthodox School of Theology, will graduate in May 2019 with a Masters of Divinity, and will serve in a church to be determined by the Lord. Both Fr. John and Presbytera Karen consider themselves the most blessed people in the world. Indeed, in the future, they both hope to see themselves changing a lot of diapers and doing missionary work along the way. Glory to God for all things!